The poster will be cut in several sheets on this mark. 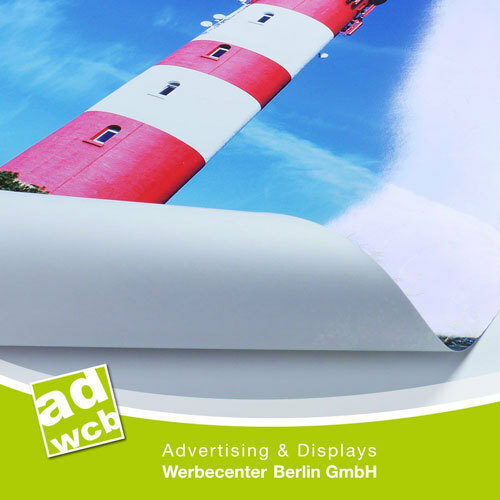 Poster in the size of your choice and printed according to your data for your advertising, decoration or information. 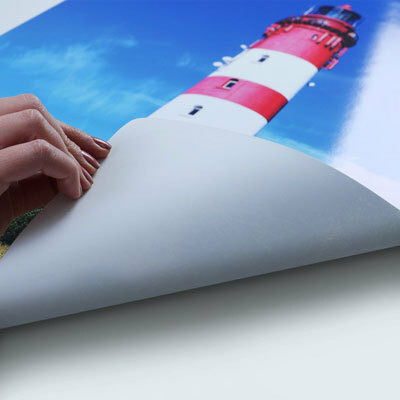 We print your custom motif optionally on matt or glossy poster paper with special UV resistant ink. Your custom poster will be rolled for shipping. Your poster will be cut to the ordered size. The max. printing width is 1.48m. Up to this value your motif will be produced in one piece. All larger dimensions will be divided according to our information sheet. If you would like to have the division at a certain point, please note us in your order. To create your data you can download our artwork guideline. The minimum size per piece is 0.5m². Even if the selection is possible in the shop, please request for smaller size in advance. Your oversized motif will be delivered diivided with an 5mm overlap. For seamless result, you may decide to double cut your foil mural. 1. Take one piece of your foil and fix it. 2. Place the second piece and apply it seamless on the other. 3. Now you can make a single straight razor line in the middle of the 2 overlapping sheets. 4. Peel away the excess paper carefully and gently smooth the cut area and the underground. Large, divided motifs will be produced with 5mm overlap of each sheet for a double cut. If color accuracy is of high priority, we recommend a proof / preprint. The proof will be printed on an 1:1 cutout in size DIN A3 on the original material. This allows you to counteract color variations and adjust them in your file if necessary.